CLICK HERE to listen to episode audio (4:02). All Web addresses mentioned were functional as of 6-23-17. From the Cumberland Gap to the Atlantic Ocean, this is Virginia Water Radio for the week of June 26, 2017. This week, the music of “Exploring the Rivers,” by Williamsburg’s Timothy Seaman, sets the stage for a Virginia river riddle. Have a listen for about 25 seconds to two river sounds recorded on June 15, 2017, and as you do, try to answer this question: How can water flow from Roanoke to Staunton and again to Roanoke? If you guessed, within the Roanoke and Staunton rivers, you’re a southern Virginia geography expert! You heard the Roanoke River in the City of Roanoke, followed by the Staunton River in the Campbell County town of Altavista. The trick is, they’re the same river! Downstream of Roanoke City, the section of the Roanoke River between Leesville Lake and Buggs Island Lake is called the Staunton River. Below Buggs Island Lake, through North Carolina and finally into Albemarle Sound, the river is again called the Roanoke. Some records or maps may use only the Roanoke name, but the Staunton name dominates locally and has a long history. Three hundred years ago, “Staunton” applied to the whole river above its confluence with the Dan River, according to William Byrd’s 1728 History of the Dividing Line Betwixt Virginia and North Carolina. Today, the Staunton River is notable for more than just its name. A 51-mile section is designated as a state scenic river. The Staunton offers rapids for paddlers, flat water for motorboats, and abundant game fish populations for anglers. And the river is home to two state parks: Staunton River State Park, a 2400-acre site with the distinction of being Virginia’s first international dark-sky park; and Staunton River Battlefield State Park, commemorating a June 25, 1864, Civil War battle focused on the Richmond & Danville Railway. A river within a river, the Staunton enriches southern Virginia’s history, recreation, and natural habitat. MUSIC - ~ 13 sec. “Exploring the Rivers,” from the 2006 album “Jamestown: On the Edge of a Vast Continent,” is copyright by Timothy Seaman and Pine Wind Music, used with permission. Mr. Seaman’s Web site is http://www.timothyseaman.com/. T his music was featured in Virginia Water Radio Episode 140, 12-10-12. All photos taken June 15, 2017. Sign for Staunton River High School in Bedford County. Walkway over railroad in Altavista (Campbell County). Staunton River at Altavista River Park. State Scenic River sign at Staunton River crossing of Route 731 at Long Island (Campbell County). Sycamore tree with rope swing over the Staunton River at Long Island Park (Campbell County). Staunton River, looking upstream, viewed from trail in Long Island Park (Campbell County). On the River’s General Characteristics“The Staunton River is located in south-central Virginia and forms the boundaries of Campbell, Pittsyvania, Halifax, and Charlotte counties. 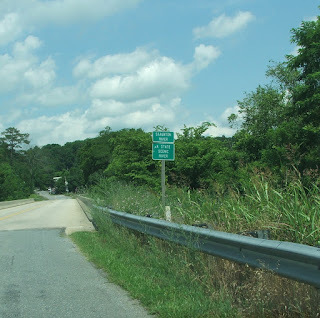 Actually an 81-mile segment of the Roanoke River, the Staunton River begins at Leesville Dam and continues to the confluence with John H. Kerr Reservoir. Bird watchers, anglers, and hunters will enjoy the bounty of the river and its adjacent bottomlands. Canoeists can experience the challenging Fish Trap (Class III) and Cat Rock (Class II) rapids. In addition, an abundance of flat water is available for those individuals seeking a more relaxing trip down the river. Large sections of the Staunton River also are accessible to motorboats. The bottomlands bordering the river are largely undeveloped and are under ownership of individuals, paper companies, or municipalities.” Source: From the Virginia Department of Game and Inland Fisheries, “Staunton River,” online at https://www.dgif.virginia.gov/waterbody/staunton-river/. “This 81 mile reach of river has two fairly distinct sections based on habitat availability. The area from Leesville Dam to Brookneal has a higher gradient, stretches with plenty of braided river channel, and a better ratio of riffles:runs:pools. For anglers, this equates to excellent habitat for Smallmouth Bass, Saugeye (Walleye x Sauger hybrid), and Walleye. The Leesville Dam tailrace offers some of the best Walleye fishing in Virginia, but fish can be found throughout this reach. The Smallmouth Bass fishing is excellent as well, with trophy fish a real possibility. Channel Catfish and Flathead Catfish are found in high abundances in this reach as well. Channel Catfish are collected in greater abundances in the Staunton River than any other river in the state, so anglers can anticipate good catch rates. While not as abundant, large Flathead Catfish are found throughout the entire reach.” Source: Virginia Department of Game and Inland Fisheries, “Staunton River Popular Report 2016,” online (as PDF) at https://www.dgif.virginia.gov/wp-content/uploads/Staunton-River-Popular-Report-2016.pdf. This seems to remain something of a mystery. One older source ttributes the name to Captain Henry Staunton, a soldier who led a patrol in the area when it was first being settled by Europeans (see R. H. Early, Campbell Chronicles and Family Sketches—Embracing The History Of Campbell County, Virginia, 1782-1926, published in 1927; accessed online at http://files.usgwarchives.net/va/campbell/history/chronicles-rivers.txt). But Captain Staunton is said to have served in the Revolutionary War, and as early as 1728, William Byrd noted that the river was called the Staunton, so it seems unlikely that it could have been named for the same Captain Staunton who was still around during the Revolutionary War. Meanwhile, the town (now city) of Staunton, Virginia, established by European settlers in 1736, was named for Lady Rebecca Staunton, the wife of William Gooch, who served as the chief adminstrative officer (called the lieutenant governor) for the English colony of Virginia from 1727 to 1749. William and Rebecca married in England in 1714, so Rebecca would presumably have been in Virginia by 1727, possibly making her the source of Staunton River name used in 1728 by William Byrd. Virginia Water Radio would welcome clarification from any listeners who have information on this subject. Sources: City of Staunton, Virginia, “History,” online at https://www.ci.staunton.va.us/government/history; and Brent Tarter and the Dictionary of Virginia Biography, “William Gooch (1681-1751),” Virginia Foundation for the Humanities’ Encyclopedia Virginia, online at http://www.encyclopediavirginia.org/. William Byrd, The Westover Manuscripts: Containing the History of the Dividing Line Betwixt Virginia and North Carolina; A Journey to the Land of Eden, A. D. 1733; and A Progress to the Mines. Written from 1728 to 1736, and Now First Published, Printed by Edmund and Julian C. Ruffin, Petersburg, Va., 1841, available from the State Library of North Carolina online at http://docsouth.unc.edu/nc/byrd/byrd.html. Historic Staunton River Foundation and Staunton River Battlefield State Park, online at https://www.historicstauntonriverfoundation.org/. Thomas L. Long, Martin H. Quitt, and the Dictionary of Virginia Biography, “William Byrd (1674-1744),” Virginia Foundation for the Humanities’ Encyclopedia Virginia, online at http://www.encyclopediavirginia.org/. OuterBanks.com, “History of Roanoke Island,” online at https://www.outerbanks.com/roanoke-island.html. Mary M. Root, “Virginia and North Carolina Boundary Line,” undated (most recent reference cited was 1989), online at Surveyors Historical Society Web site, http://www.surveyhistory.org/va_&_nc_bounary_line.htm. Dan Shaw, OldHalifax.com, “Staunton Scenic River Tour,” online at http://www.oldhalifax.com/county/StauntonRiverTour.htm. Brent Tarter and the Dictionary of Virginia Biography, “William Gooch (1681-1751),” Virginia Foundation for the Humanities’ Encyclopedia Virginia, online at http://www.encyclopediavirginia.org/. University of North Carolina-Chapel Hill Library, “Documenting the American South: William Byrd, 1674-1744 and Edmund Ruffin, 1794-1865,” online at http://docsouth.unc.edu/nc/byrd/summary.html. U.S. Army Corps of Engineers, “John H. Kerr Dam and Reservoir,” online at http://www.saw.usace.army.mil/Locations/District-Lakes-and-Dams/John-H-Kerr/. U.S. Geological Survey, “Geographic Names Information System/Roanoke River,” online at https://geonames.usgs.gov/apex/f?p=gnispq:3:0::NO::P3_FID:1502110. Virginia Department of Conservation and Recreation, “Scenic Rivers Program,” online at http://www.dcr.virginia.gov/recreational-planning/srmain. Virginia Department of Conservation and Recreation, “Staunton River State Park,” online at http://www.dcr.virginia.gov/state-parks/staunton-river#general_information. Virginia Department of Conservation and Recreation, “Staunton River Battlefield State Park,” online at http://www.dcr.virginia.gov/state-parks/staunton-river-battlefield#general_information. Virginia Department of Game and Inland Fisheries, “Staunton River,” online at https://www.dgif.virginia.gov/waterbody/staunton-river/. VDGIF, “Staunton River Popular Report 2016,” online (as PDF) at https://www.dgif.virginia.gov/wp-content/uploads/Staunton-River-Popular-Report-2016.pdf. Virginiaplaces.org, “Staunton vs. Roanoke River,” http://www.virginiaplaces.org/watersheds/stauntonroanoke.html. VirginiaPlaces.org, “Virginia-North Carolina Boundary,” http://www.virginiaplaces.org/boundaries/ncboundary.html. Virginia Water Central News Grouper posts on news, events, and information resources relevant to the Virginia’s southern rivers—that is, those in the watersheds of the Ohio River/Gulf of Mexico or Albemarle Sound in North Carolina, and not in the Chesapeake Bay watershed—are available online at https://vawatercentralnewsgrouper.wordpress.com/category/water-quality-and-habitat-in-virginias-southern-rivers/. All Water Radio episodes are listed by category at the Index link above (http://www.virginiawaterradio.org/p/index.html). See particularly the “History” subject category, and for previous episodes on specific rivers or other water-related geographic features in Virginia, the “Rivers, Streams, and Other Surface Water” category. Following are links to some selected episodes focusing on Virginia’s water-related geography. Watersheds - Episode 156, 4/8/13; Episode 209, 4/14/14; Episode 251, 2/2/15; Episode 365. 4/24/17. USI.4 – European exploration in North America and western Africa.